For the fifth consecutive year, ArtSpace/Virginia Miller Galleries participated in this nation’s leading Latin American art exposition, arteaméricas.This was the first time the event was held in Miami Beach Convention Center, site of Art Basel. 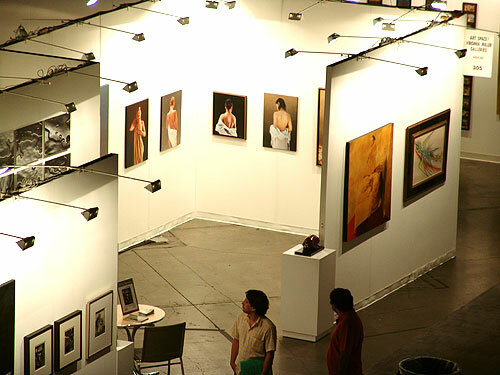 The fair featured seventy leading galleries exhibiting more than 300 artists. Miller has been exhibiting Latin American works since shortly after opening her gallery in 1974. For some years, hers was the only gallery in the Miami region to feature Latin American paintings and sculpture. “I have always believed that Latin American art is some of the most exciting and under-priced on the market,” said Miller. For arteaméricas, Miller selected a mix of historic and mid-career artists. The former included two important paintings by the Cuban master Wifredo Lam, a 1959 oil and a 1957 oil on paper bonded to canvas. Among the other works were three by the Mexican master Francisco Toledo, a gouache-and-ink dated 1965, and a watercolor thought to be from the same period, and a black-and-white drawing dated 1978. Rounding out the older works was a spectacular 1978 painting by the master artist of El Salvador, Benjamin Cañas. Nearly four feet square, the oil-on-panel includes the exquisitely drawn figures and velvety backgrounds that have earned him such an enthusiastic following. Mid-career artists included three who recently won major awards. Irene Pressner, an emerging artist from Venezuela whose encaustic works are done with ink applied with a tattoo needle, topped a field of 132 leading Latin American artists to win the $50,000 first prize and inclusion in the permanent collection of the Museum of Latin American Art in Long Beach, California. Pressner’s winning work was one of her “Rococomics” series, a 28-inch-square encaustic work similar to those presently being exhibited in the gallery. The series incorporates well-known cartoon characters, like Dennis the Menace and Woody Woodpecker, into elegant floral patterns so perfectly that they are not apparent at first glance. Closer scrutiny causes the shock of recognizing well-known comic characters in their incongruous settings. The apocalyptic visions of Sergio Garval of Mexico won the first prize of $50,000 at the Rafael Cauduro First Biennial of Drawings Competition of the Americas held in Tijuana, Mexico. Garval won the award for a charcoal-on-panel drawing from the same series exhibited at arteméricas. The Joan Mitchell Foundation recently notified sculptor Melquiades Rosario Sastre of Puerto Rico that he was one of 25 artists to be awarded $25,000 grants “to acknowledge painters and sculptors creating works of exceptional quality.” Melquiades, who uses only his first name, was represented at the fair by one of his complex wood sculptures. Centering the booth was an installation by Soledad Salamé of Chile, whose six-page resumé includes four solo museum exhibitions in her native country and the U.S.Â Its nine 16-by-20-inch solarized photos etched into aluminum plates spread over more than five by four feet, their silver and gray images shimmering like three-dimensional puddles of liqud mercury. Some of the booth’s most popular features, particularly with younger fairgoers, were the whimsical small-scale egg tempera and gold foil paintings by Marianela de la Hoz. As suggested by the Mexican artist, a magnifying glass was provided so viewers could read such titles as “My voice rasps, I feel like a man” for a diminuitive portrait of a man with the head of a fully antlered stag. Hugo Crosthwaite‘s pencil-and-charcoal drawings, particularly the larger work, which stretches nearly six feet tall by five feet wide, drew the usual gallery of onlookers. A virtuoso who always draws his hometown of Tijuana and its working-class residents, Crosthwaite has the extraordinary ability to bring his subjects to life in black and white. At any given time during arteaméricas, more people probably stood before the sensual nudes of Marcelo Zampetti than at any other spot. The Argentine artist captures the sensuality of his female subjects with an inner light that compels viewers to examine them closely. The most common question heard in the booth was whether the lifelike oils on canvas were photographs.